In south central Pennsylvania, the days are longer and the temperatures are rising, prompting more people to spend time outdoors. With spring, however, comes an increased risk for slip and fall accidents on neglected sidewalks and patios. Falls account for more than 8 million U.S. hospital emergency room visits, representing the leading cause of visits, according to the Centers for Disease Control and Prevention. Fractures are the most serious consequences of falls. It’s essential business owners and homeowners know their responsibilities to ensure their properties are safe and to protect themselves from premises liability. Premises liability could result from a simple sidewalk crack or a serious patio collapse. Too often, just a few simple steps can be taken to ensure detrimental accidents do not occur on your property. Inspect the property on a regular basis to identify dangerous conditions. Check for structural stability. These can be the most costly repairs, but the most important. Weak or rotting floorboards, for example, can lead to fatal accidents. Patios and decks, which are exposed to the elements year-round and often include stairs, are especially of concern for structural stability. Look for potential fall hazards. Do all stairs and balconies have railings? Are all steps clearly visible? Lighting must also be deemed adequate, so keep that in mind if you’re inviting people over — or if your business is open — after dark. Look for potential tripping hazards. Uneven surfaces are easy to overlook, but most fall injuries at home happen at ground level, not from an elevation, according to the National Floor Safety Institute (NFSI). Sidewalk cracks are often fairly inexpensive and quick to repair. Check for slick spots. You might think winter is over, so ice is no longer a concern. But a leaking patio roof could still cause a visitor to slip and fall. Warn people of dangerous conditions. If you know a structure is unsafe, or there is a potential for a slip and fall accident, be sure to mark the area immediately. Sometimes a sign is not enough to effectively communicate the danger. Consider partitioning off the area. Fix dangerous conditions in a timely manner. When an accident occurs, medical bills can pile up quickly, especially if the injured person is unable to return to work and loses wages. 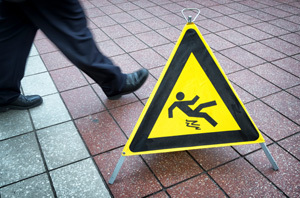 Slip and fall accidents represent the primary cause of lost days from work, according to NFSI. If you think you have an injury that resulted from premises liability, contact one of Katherman Briggs & Greenberg’s personal injury attorneys 24/7. We will work to get the Results You Deserve®.